On November 11th, Nintendo will release the NES Classic Edition in the US for $59.99 (the UK version launches for a similar price around the same time). 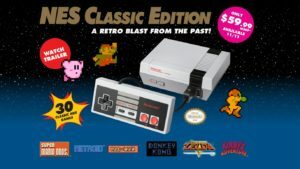 The mini retro console will include 30 classic NES games and while we all have our favorites, most everyone agrees it’s a pretty solid list of titles. Still, the RandomTower crew thought it would be fun to come up with our own lists of 30 NES games and revealed them on last week’s podcast. For convenience’s sake, I’ve reproduced our lists below so you can compare them to Nintendo’s. Games not on the original list are highlighted in red. Let us know what you think in the comments below and don’t be shy about sharing your own lists. « How Much Would You Have To Spend To Get All The NES Classic’s Games? Plus sequels and other games in the franchises already there. Especially StarTropics 2. I still remember the week I borrowed Metal Storm from a friend at school. I had so much fun. The game is frustratingly difficult, but the rewards are for playing well are absolutely worth it.